As I’ll often do here, I’ll give a little backstory about what I knew about the film before I saw it. The answer is very little — the name of the film sounded familiar and that was about it. Searching around a bit before watching, I came to the conclusion that the reason I’d heard about it was it was nominated for several Academy Awards in 1988, including a win for Kevin Kline as Best Supporting Actor. Other than that, I went in to this film with a blank slate. Given the pedigree of this film, written by Month Python alum John Cleese and also staring him and Michale Palin, you can already make some guesses as to what this film is like. Very British, very out-there, and very funny. In prior review I may have mentioned my experience with Monty Python and the Holy Grail — hint: I didn’t find it funny the first viewing. After watching it repeatedly however, and hearing both my dad, friends, and others quote the film often, the style of humor and the specific jokes began to grow on me. Very dry and very deadpan but also combined with a bit of levity. A Fish Called Wanda to no surprise delivers a similar style of humor. I would say there’s a competition between Kevin Kline (again, won Best Supporting Actor) and Michael Palin’s characters in this film for who is funnier. Otto West (Kline), is the philosophical - don’t call him stupid - ah, let’s say, clueless character. A combination of Kline’s performance (again, deadpan and dry) with the direction and blocking, create a hysterical trove of comedy gold. It is deadpan, but also flamboyant — very flamboyant. No subtlety whatsoever as he pops up from nowhere, or bursts into a room spouting Italian phrases. Michael Palin on the other hand, the stuttering side-character/classic comic relief has perhaps one of the funniest sequences/arcs I have seen in a while. I will leave the plot details out and only say that the escalation and irony Ken Pile goes through in this film is quite the sight to behold, and you’ll be laughing your head off anytime you see him on screen. As funny as this film was, the downside is that the story arc seems a bit thrown together. Ken Pile’s storyline specifically, while laugh-out-loud funny, also makes you scratch your head as to why it’s happening. The reason is explained, but he’s seen very intermittently that you can only wonder if the punchline could be delivered sooner, or be incorporated throughout the film more. Another problem area is the pacing, which is very similar to Holy Grail and also Animal House - read: not my favorite parts of either film. Holy Grail and Animal House are heavily front-loaded with a seemingly missing back half/three quarters of a film, at least from my recollection of them. A Fish Called Wanda is a bit more even paced than that and has both an exciting ending and not as much of a lull in the middle (thanks to the Ken Pile storyline), but it doesn’t feel cohesive. There’s just a bunch of parts, good and funny parts, but alas just parts that can seem patched together in order to keep the film going. 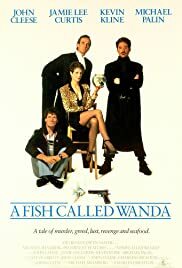 For those who are fans of the Monty Python style of humor and/or exaggerated physical comedy courtesy of Kevin Kline and Michael Palin’s terrific performances, A Fish Called Wanda should be of interest to you. It’s as they say, an oldie but a goodie.